Frisco, TX- Texas fight fans may not remember everything that happened at the Star in Frisco tonight, but something tells me that February 2, 2019 may be remembered by boxing insiders as the day they first saw just how special Kazak middleweight Janibek Alimkhanuly is. This kid is an amazing prospect, and I think it won’t be long before he explodes on the scene. After watching his demolition of New York’s Steven Martinez I was left speechless. This kid is the total package. An amazing jab, great counterpunching, and the size and speed to dominate a lot of good middleweights. 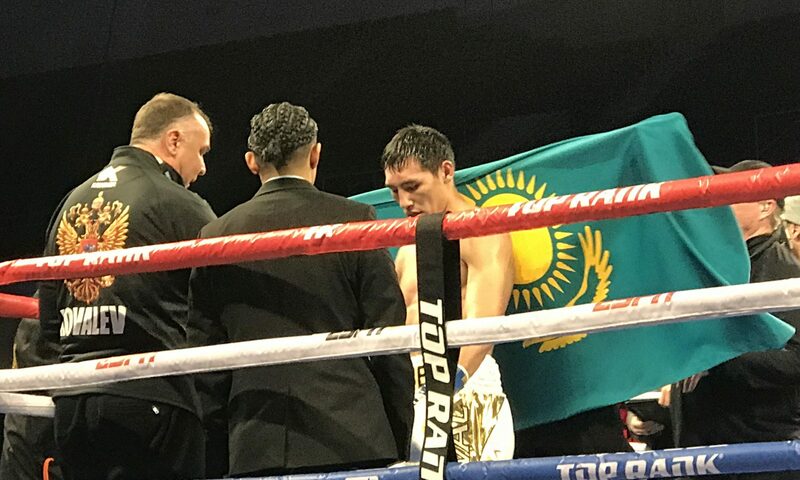 In the fifth fight of the night boxing fans in Texas we treated to a first taste of what may very well be one of boxing’s next superstars and undefeated Janibek Alimkhanuly, 162, of Kazakhstan dominated the seasoned Steven Martinez, 160.4, of the Bronx. Martinez came into the fight with a reputation as something of a borderline contender, having lost close decision to then undefeated Terrell Gausha in 2016 and then another decision he dropped to undefeated Christopher Pearson in 2014. Although Martinez had come up short when he stepped in with top level opponents in the past he had never been stopped and always gave a solid performance. But against the talented southpaw from Almaty Martinez was dominated from the opening bell. Alimkhanuly cruised in round one and continued to box beautifully in the second, teeing off on the New Yorker in the closing seconds of the round. 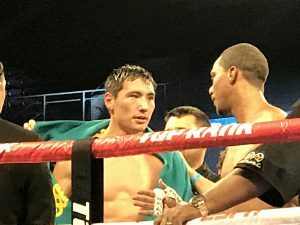 The Kazak wisely incorporated the body attack in round three and dropped Martinez to a knee with a perfectly times counterpunch in the opening minute of the round. By round four Alimkhanuly began to toy with Martinez, trapping him on the ropes before stepping back to wave his opponent in. 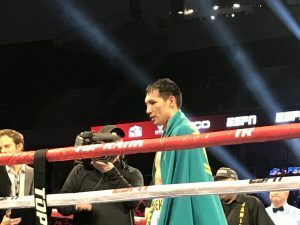 A vicious left uppercut snapped the head of Martinez back in the closing minute of round four and the Kazak continued to dominate at the start of round five. Seconds into the round another left uppercut snapped the head of the New Yorker back, prompting his corner to throw in the towel. Referee Neal Young waved the fight off at 0:21 of the fifth round. With the win Alimkhanuly improved to 5-0, 2 KOs while Martinez slips to 18-5, 13 KOs.